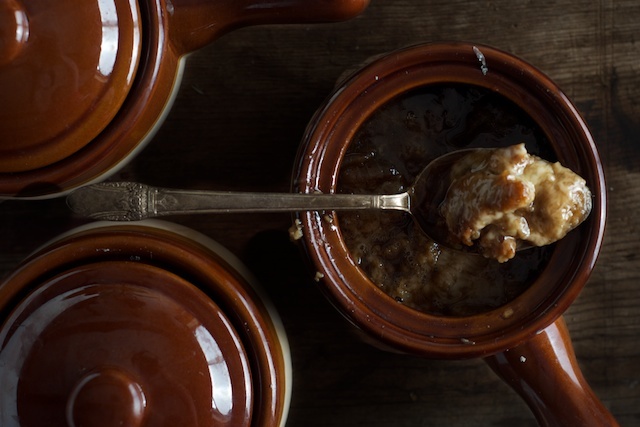 French onion soup, those little pots of slow-simmered onions and bubbling cheese, warms our bellies on cold autumn days. While I’ll always have a place on my table, in my belly and in my heart for other favorite cold weather soups like curried lentil soup, egg drop soup with duck and slowcooker chicken soup, there’s something special about this French Onion Soup recipe. I make it frequently in winter – combining the mountains of onions we purchase in bulk each autumn from regional farms with homemade beef stock (though, if I’m lucky enough to have it, I prefer using pasture-raised veal stock). I float a thin slice of day-old no-knead sourdough bread in the fragrant soup, top it with a smattering of Gruyere cheese, bake it and serve it with another winter staple: homemade sauerkraut. If you’ve read Nourished Kitchen for any length of time, you know how deeply I value real, homemade broths, bone broths and stocks. My husband and I typically consume about a quart (each) a day, in soups and stews, in gravies and pan sauces, and on its own with a sprinkling of chopped garlic and minced parsley. 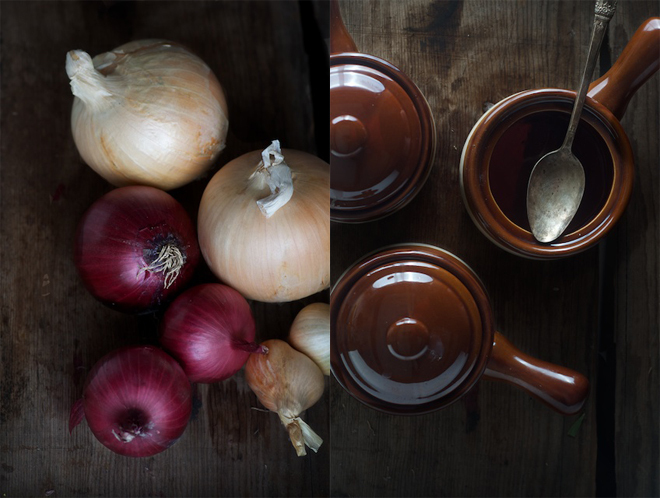 And it’s this love of the simple beauty of broth that leads me to emphasize soups in my cooking – whether it’s French Onion Soup or another. Long-simmered broths made of meat scraps, bones, skin and cartilage play a role in culinary traditions around the globe where they were valued for their nutritive and restorative properties. Soups made from long-simmered bones, vegetables and a bit of cut-up bone marrow or meat, featured prominently in the daily meals of the Swiss villagers of the Loetschental Valley, while African villagers emphasized bone broths in the nourishment of mothers, babies and small children (you can read more about these practices in Nutrition and Physical Degeneration by Dr. Weston Price). 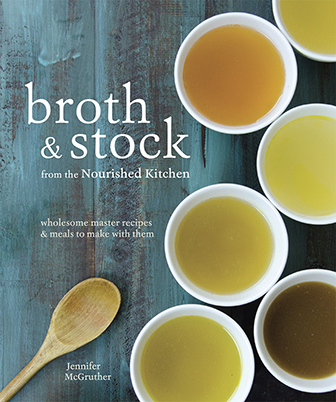 Extraordinarily rich in minerals and easy-to-assimilate proteins, broths and stocks do much more than provide a base for soups, stews and sauces; rather, they support systemic wellness in a way few other foods hope to achieve. Rich in collagen, they support skin health and digestive system function. Rich in minerals, they provide an alternative source of calcium for those who avoid dairy by necessity or choice; further, the calcium in broth is more bioavailable than that of leafy greens whose calcium is often bound by oxalic acid. (Read more about the benefits of bone broth including how they support the adrenals, bones and teeth as well as the classic piece Broth is Beautiful). Bone broths, broths and stocks are easy enough to make at home. In its simplest form, a good bone broth can be nothing more than bones simmered in clean water for a long time. Vegetable scraps, herbs and spices add flavor, while vinegar or wine can help to leach minerals from the bone and into the broth. While meat broths and traditional stocks can take a few hours to make, bone broth can simmer for days or, in the case of perpetual stock – even a week or longer as you dip in and out of the slow cooker. For those of you that haven’t the time, interest or desire to make your own long-simmered bone broths, you can order real bone broth online (see sources) as there’s a smattering of artisan producers who have just recently made their broths available for retail sale. It’s a long sight better than storebought bouillons and canned broths, but you’ll spend a lot more than you would by making it at home. Sweet with the flavor of long-simmered onions, this French onion soup also takes a savory note from reduced beef stock, bay, black peppercorns and thyme. Melt the tallow in a heavy-bottomed stock pot over medium-high heat, then stir in onions and shallots. Reduce the heat to medium-low and stir in salt. Cover and sweat the alliums, stirring frequently, until softened and translucent - about 10 minutes. While the alliums sweat, tie bay leaves, thyme and peppercorns together in a piece of cheesecloth or a small muslin bag, and add it to the pot. Stir in beef stock and wine, then simmer, uncovered, for 20 to 30 minutes or until the stock is reduced by ⅓.
Ladle into oven-proof soup bowls (like these.) Top with a piece of day-old sourdough bread and 1 ounce shredded Gruyere cheese. Cover and bake for 20 minutes, then serve. Thanks got a great article. I have been making bone broths for my entire life. Your articles have been the catalysts to not buying any even in a pinch. I also had a second knee surgery earlier this year to remove my shredded meniscus that had been repaired 12 years ago. Now I’m flirting with knee replacement. I do not want.that so after reading how much glucosamine is in broth I’m gonna eat it daily. Thanks for that information. I really appreciate knowing anything that can stave off knee or any surgery. Thank you for reminding me about the healthy benefits of beef bone broths. I have a lot of chicken stock on hand in the freezer but not a lot of beef broth. Must make a batch soon! Thank you so much for the information and resources on bone broths. I look forward to reading more about its healing properties. And what a great idea to serve this soup with sauerkraut. Sounds like a great match! Oh goodness, that looks like exactly what you want to eat on December first. I still have never made my own beef broth, but I always have my own chicken bone broth on hand. Beef is next once I get my hands on some bones! Thanks for the reminder. HI! My family is all on homeopathic remedies right now, & we cannot eat beef, as this will antidote all of our remedies! Where can I purchase organic grassfed veal broth/stock? I really want to make this french onion soup for our family Christmas get-together! Thank you! The only possible point I would disagree with is whether it is truly French. I have a foodie friend in France who was appalled to learn that Americans name French onion soup with beef broth. She said that in France, the vegetarian broth in this dish is flavored by onions that have been cooked for a very long time until they disintegrate into a paste. I made my bone marrow broth after roasting my bones and marrow….but my stock came out white….how do I make my french onion soup brown like you see in restaurants? Also, I am starting a magazine, and I would love your blog and would love to promote it. My magazine is called Ageless Woman, and you offer so many healthy tips for aging women. Would you write something and send me some 300 dpi pics of healthy winter soups and put one of your recipes? We could build traffic on your blogsite and in my magazine! I don’t have an answer regarding your broth turning white, but my brother (who worked as a cook in several restaurants) told me this insider’s secret: while some restaurants do use beef broth as a base for Onion Soup, there are many who caramelize sugar to achieve the brown color in the broth. The sweeter flavor will be the giveaway to this less expensive and quicker method of making the soup. Oh, and my website is not live yet, but please check out the facebook page for my Ageless Woman Magazine at http://www.facebook.com/AgelessWomanMagazine. And please like us. The magazine is a lifestyle magazine in central Virginia for women over 40. We’re also looking to franchise it nationally. 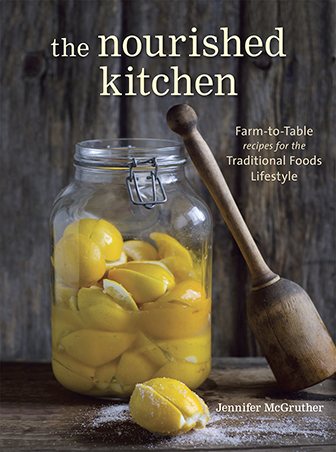 So imagine one day when there are a thousand Ageless Woman franchises around the country and you get to put your recipes in it! Right now, we’re small. Only 10,000 magazines in a 9 county area of central Virginia. i appreciate your reaching, but, at this time, it’s not a good fit for me. What can be used to substitute the dry white wine with? Thanks! Wondering about the white wine substitution as well… or if I can just leave it out? I add good beef to my soup. It is more hearty and filling.